Microbial community structures in hydrocarbon-contaminated soils from different geographical origins, soil types and with different physico-chemical properties demonstrate important patterns that alter in response to the contamination event itself, and during subsequent biodegradation. The initial microbial community structure in a soil is a function of the geographical location, the properties of the soil and the environmental conditions. The addition of nutrients, levels of contamination, moisture and other physico-chemical parameters influence the predominant microbial populations. Arid, alpine and polar soils, which are typically nutrient- and moisture-limited are often dominated by K-strategists such as Actinobacteria, that are well adapted to low resource environments, and do not show major alterations as a result of hydrocarbon contamination. In hydrocarbon-contaminated soil, including alpine and polar soils, there is a dominance of Proteobacteria especially in the early stages of hydrocarbon degradation. All groups of Proteobacteria, with the possible exception of the Epsilonproteobacteria, respond positively to the influx of hydrocarbon substrates and also to situations in which supplemental nutrients (N, P) are supplied. This pattern is altered over time as hydrocarbon degradation reaches its plateau, and is frequently dominated by Gammaproteobacteria. In temperate and tropical soils, the microbial community structure is more diverse and the responses are not as pronounced, although again, the Proteobacteria are typically dominant following hydrocarbon contamination. 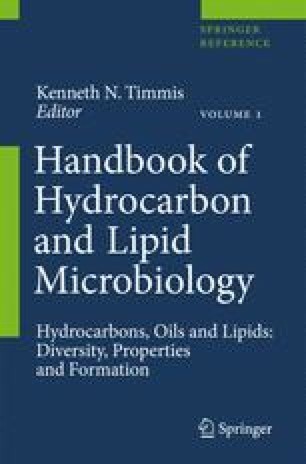 As more information becomes available on the microbial community structures and their response at the community level, more effective biodegradation strategies can be developed to capitalize on this succession of active hydrocarbon degrading microorganisms. Energy Information Administration (EIA). 2005. International Energy Annual 2005, web site: www.eia.doe.gov/iea.